I'm still not sure of these, and I threw them out last night. It’s been a while since I updated, chiefly because I’ve not been out too much, and my recent forays have been fruitless. 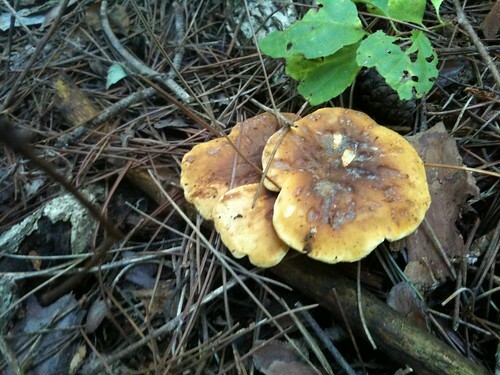 I was disappointed to have come up entirely blank in terms of chanterelles, though, admittedly, I didn’t get out in late June, and may have missed my best opportunities. However, a bumper crop of mosquitoes was very de-motivating. 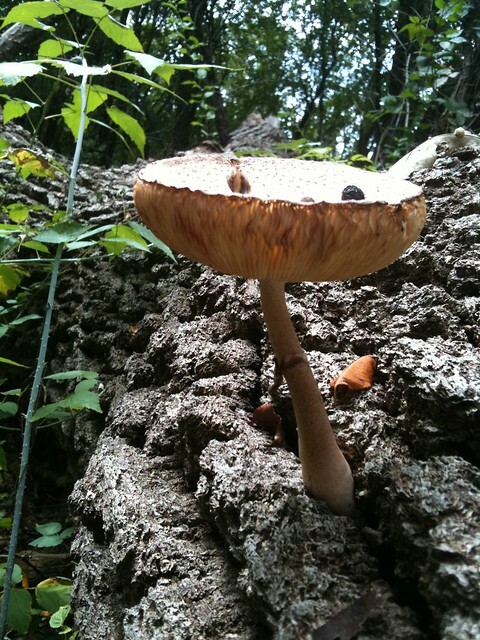 I sallied forth yesterday, with some interesting – albeit inedible – results. Today is another beautiful day, and I plan to visit some spots in southern Wisconsin to see what I can see. 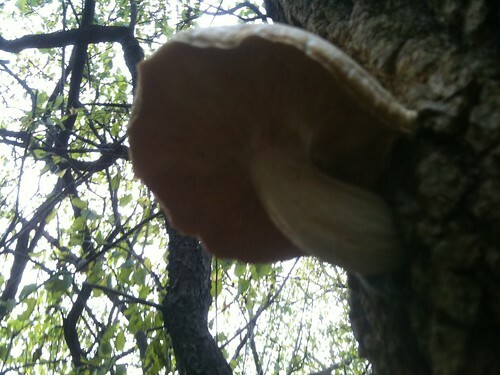 Yesterday I went through the wood near my home. 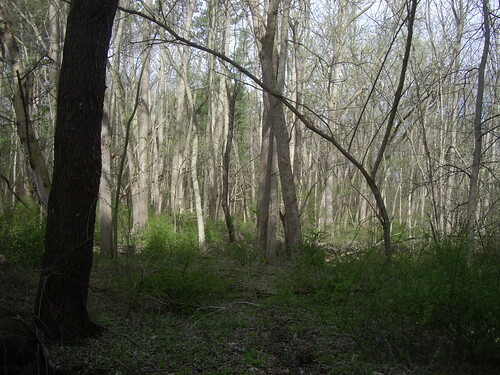 It’s a varied wood – a scrubby boarder of elm, cherry and a lot of junk (buckthorn, boo) ringing more mature growths of conifers and oaks. 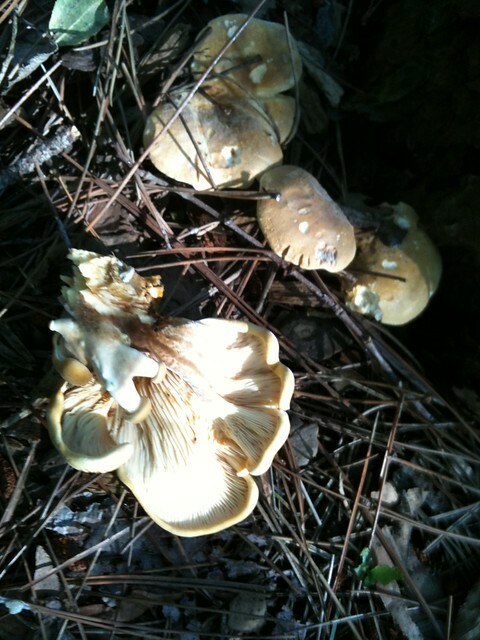 In the conifer grove I spotted a bunch of russet-topped, yellowy-gold mushrooms growning from dead wood. 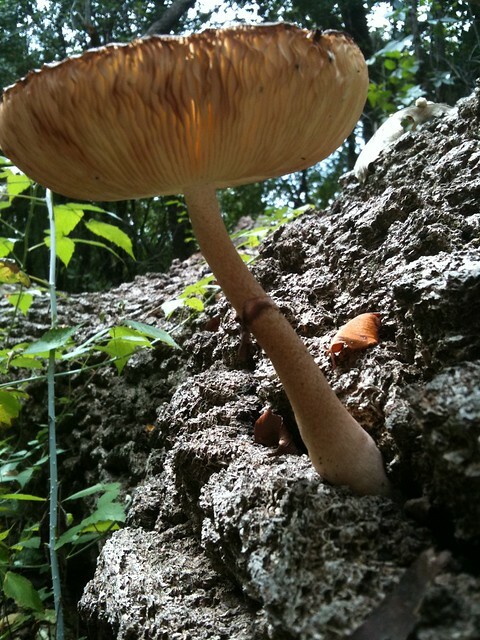 They had off-set stems, and grew in clusters. 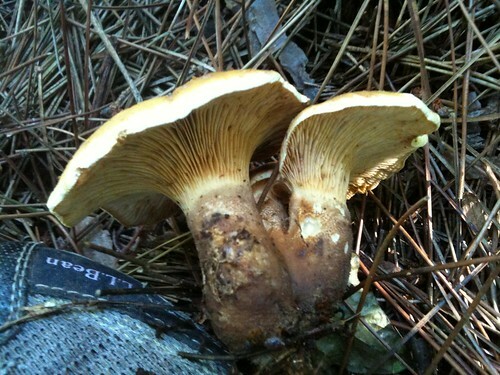 But they weren’t chanterelles. Oysters, maybe? 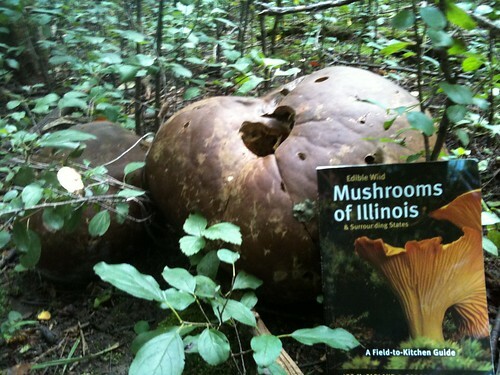 The mystery mushrooms were plentiful, and smelled really good – rich and mushroomy, not at all foul or unpleasant. They were meaty, fresh and substantial. I stuck a few in the bag to take home to ID. You'll forgive me for first thinking these were oysters. 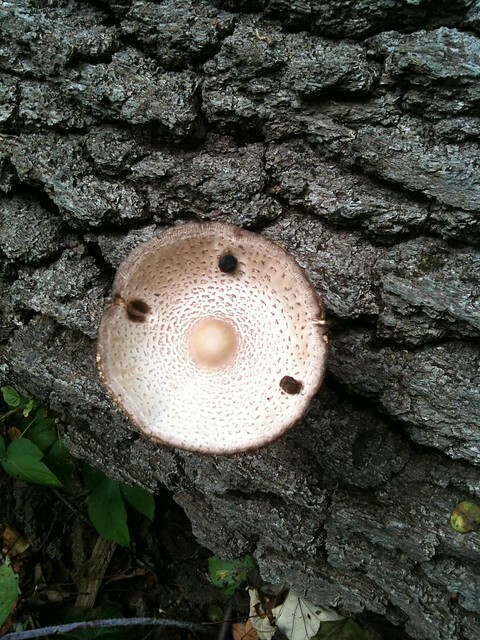 The spore print was clear and vivid. I tried to ID these, and I believe it’s a Velvet Footed Pax. There appears to be some debate over whether the genus is Paxillus or Tapinella, but all guides I consulted agreed on the species: atrotomentosa. 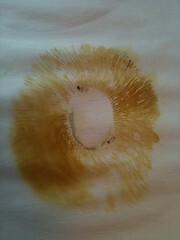 The spore print was golden yellow, turning brownish when I left the cap on the paper for hours. 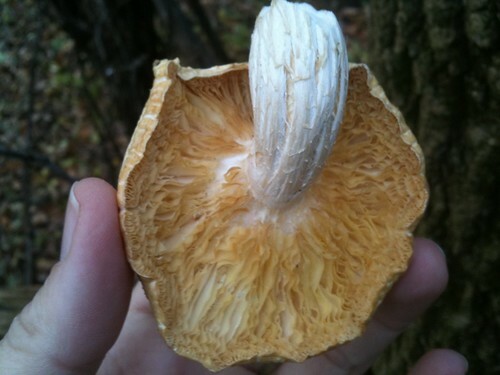 And the fat, brown, fuzzy stem on larger specimens was distinctive. It was pretty clear I had a big batch of inedible mushrooms! Into the trash they went. 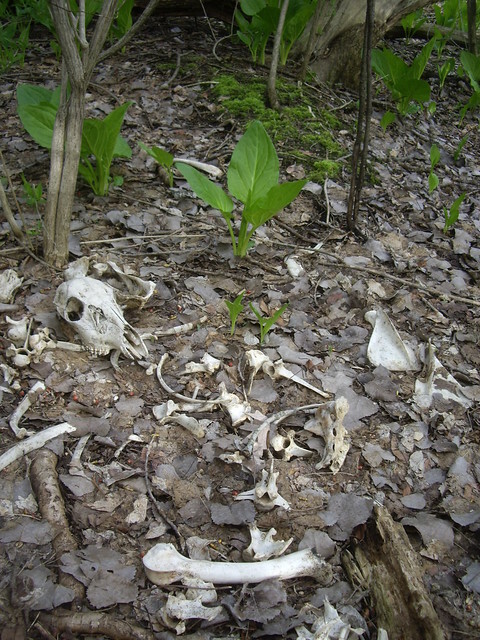 While in the woods, I also decided to try to find the spot where I had found some very expired but at one point ginormous-puffballs-of-some-stripe very early this spring. I bumbled around and eventually hit the jackpot. These monsters were enormous – the size of good size watermelons! 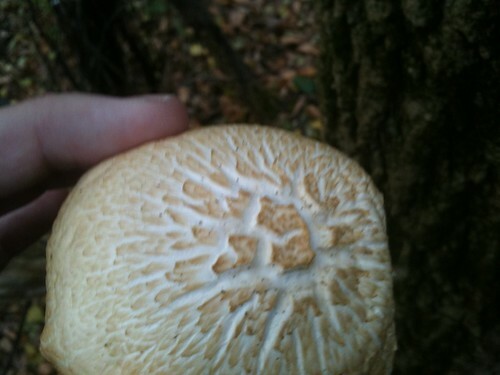 Immense, and aged, puffballs. I am not sure of the species. 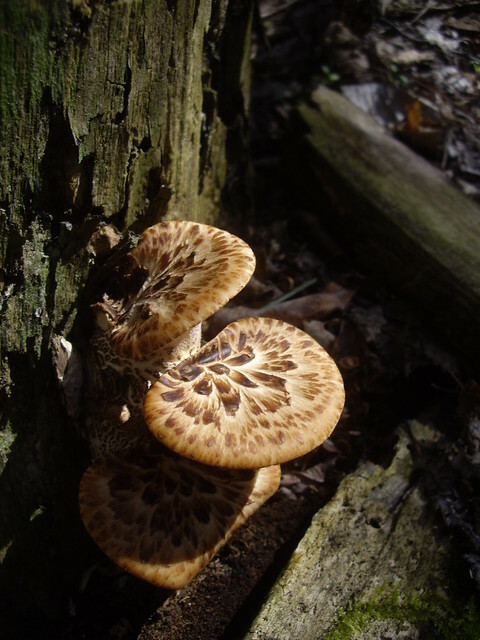 This was a good sized cluster, and they were aged. However, I couldn’t resist cutting into one, using a sharp broken stick. It appears that the insides were once white. 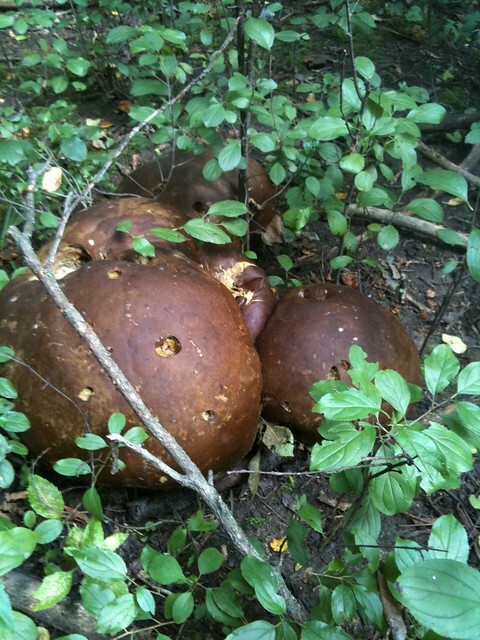 Were these giant (delicious, edible) puffballs? I don’t know. But I will be checking this spot earlier next year. Another cluster of big puffballs, species TBD.